By the Editors of this Website! Beyond the Web Page... The only book devoted exclusively to the Matador and Mace Tactical Missiles. The book reveals the story from the initial idea that became the first U.S. pilotless bomber, through the politically troubled development of the ever evolving deployment methods of the Matador and Mace Tactical Missiles. It covers the Units, Groups, Squadrons and Wing that fielded the missiles. From the United States test sites, Europe, Asia and North Africa nothing is omitted. 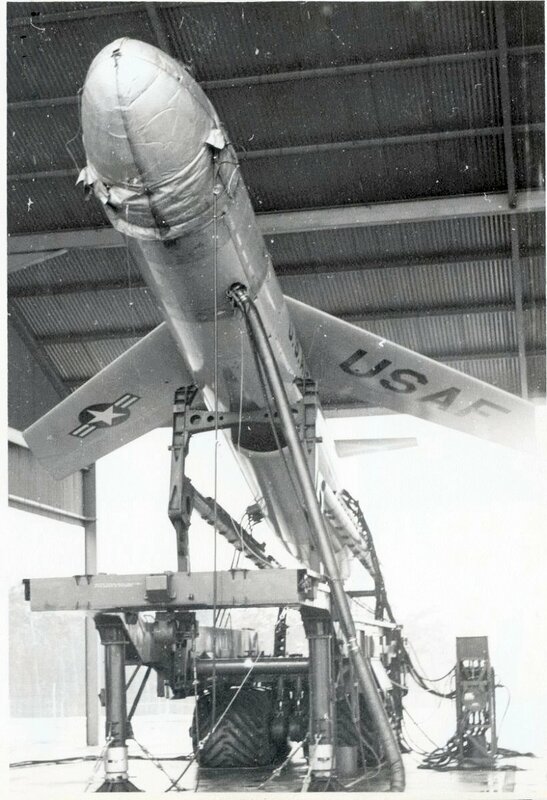 All phases of the application of these two missiles by the U.S. Air Force (and West German Luftwaffe) are included, from the first tentative launches of the XSSM-A-1 Matador in January 1949, to the tense alert duty of the Cuban Missile Crisis, and the final launch of a MQM13A in May of 1977. The maintenance, logistics and launch, the men, equipment and tactics are all there. "Bob, George, I finished your book 2 days after I received it. Couldn't put it down. It was incredible reading and incredibly detailed information." "George and Bob. I want you both to know how much I enjoyed reading and how much I admire and appreciate what you have accomplished in developing and publishing "The Pioneers". It is truly an outstanding piece of work, reflecting the time and effort required to produce it, but is also a formidable contribution to our military history. I mentioned in some earlier correspondence that I was a little disappointed in the relatively small amount of information regarding the Operating Location/Guidance Sites but you largely made up for it with this magnificent book." "I just finished your book, The Pioneers, et al. Please accept my "job well done!" Not only is it informative, but it's very readable. I'd also like to complement you on how well you footnoted it. You have shown that a scholarly work can be both instructive and enjoyable." "Very good work with great detail." ...For me it is fascinating to see what the picture really was in the 1950s and 1960s as opposed to what the official communication of the time wanted people to believe. A fascinating book shedding some light on the early days of tactical nuclear missiles as well as the political background that even today is still largely hidden behind the propaganda of the time. Can't wait to read the rest of it." 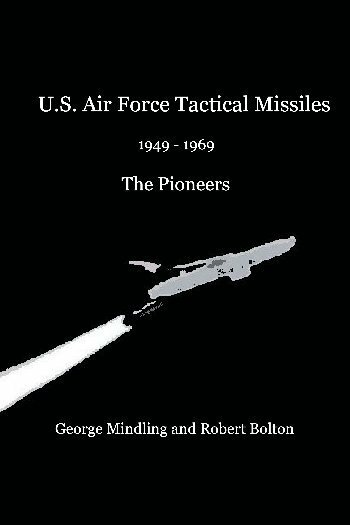 "U.S. Tactical Missiles 1949-1969 The Pioneers"
"I have your excellent book on USAF tactical missiles. 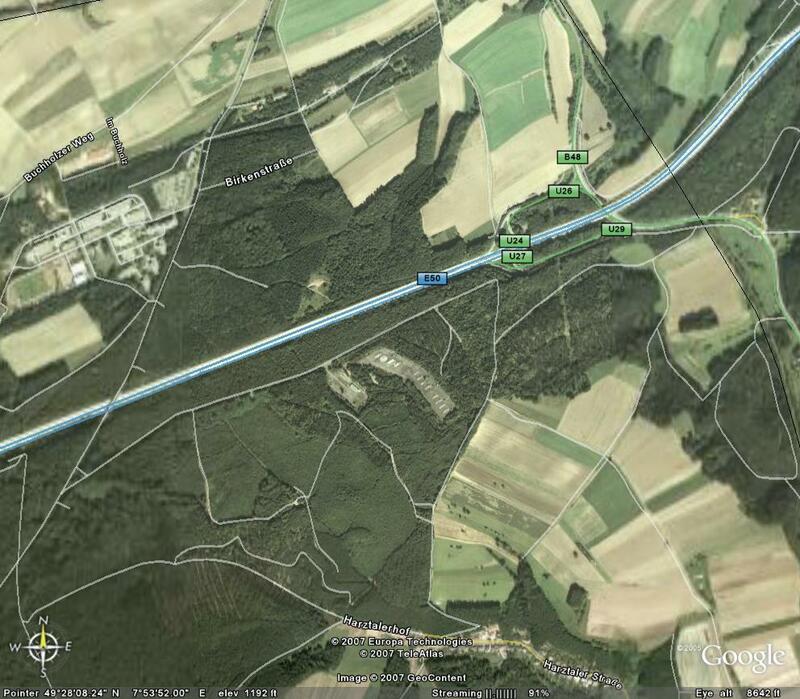 I actually witnessed the decommissioning of the Maces at Wüscheim back in 1966." "I just wanted to drop you a line and tell you how much I enjoyed the book that you and Bob wrote. The history was of particluar interest to me and my brother who was a history Professor at the University of Wisconsin. He also thought the book was well written, and he now knows what his little brother, (me), did while in Germany for three years." "...by the way, I read your book, it was great, thanks for writing it." Inspired by the 38th TMW Website, George Mindling and Robert Bolton co-authored US Air Force Tactical Missiles 1949 - 1969: The Pioneers ©2008, the story of America's first operational missiles, from the Matador to the Mace, from Taiwan, Korea, and Okinawa to Germany, including Lowry, Orlando, Holloman, Santa Rosa Island at Eglin, and even Camp Happiness! 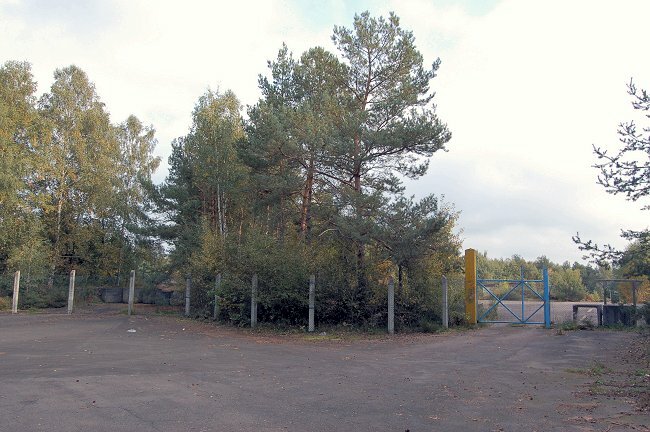 Dieses Buch ist ein Muss für alle, die im Rahmen ihres Dienstes bei der U.S. Air Force mit den frühen Marschflugkörpern zu tun hatten, aber auch für deutsche Militärarchäologen, die in der Eifel, im Hunsrück oder im Pfälzer Wald schon über rätselhafte Hinterlassenschaften gestolpert sind. Nach mehr als 40 Jahren wird endlich eine Fälle von Fakten, Informationen und Geschichten zu den zwischen 1954 und 1969 in Deutschland stationierten, mit Automwaffen ausgerüsteten amerikanischen Matador und Mace auf den Tisch gelegt. Ausführlich und lebendig erzählen George Mindling und Bob Bolton von den jungen Missilemen, die im März 1954 erstmals in Bitburg ankamen - noch ganz grün im Gesicht, weil auf dem Atlantik schwerer Sturm geherrscht hatte. Von den T-33-Flugzeugen, die aus übungsgründen so taten, als wären sie Matador-Flugkörper, über die Startstellungen hinweg in Richtung deutsch-deutsche Grenze donnerten und sich von der Gegenseite nur nicht erwischen lassen durften. Oder von der Kuba-Krise, als die US Air Force Europe auf DEFCON 3 ging und an die Mechaniker in Bitburg Munition für ihre Karabiner ausgegeben wurde. Augenzeugen sagen dazu: "Wir hätten die Vögel auf jeden Fall innerhalb von 15 Minuten in der Luft haben müssen!" Es ist lebendige Militärgeschichte, die nun nicht der Vergessenheit anheimfällt, sondern jedermann zugänglich wird - auch für die ortsansässige Bevölkerung, die heute endlich erfährt, was sich damals in ihrer Nachbarschaft zugetragen hat. 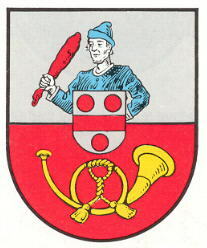 Den beiden Autoren gebührt der Dank. This book is not only a must for all those who served in the U.S. Air Force with the early cruise missiles, but also for German military archeologists who have been puzzling over relics stumbled across in the Eifel, the Hunsrück and the Palatinate Forests. After more than 40 years, we finally have a wealth of facts, information and stories, from 1954 to 1969, of the nuclear equipped American Matador and Mace missiles stationed in Germany placed on the table. With detailed and vivid descriptions, George Mindling and Bob Bolton talk about the young Missilemen who arrived for the first time in March, 1954, in Bitburg - still green in the face, having prevailed the Atlantic crossing in major storm. Of the T-33 aircraft which practiced as if they Matador missiles launched in the direction of German-German border, or from the Cuban missile crisis, when the U.S. Air Force Europe went on DEFCON 3 and was issued ammunition to the mechanics in Bitburg for their rifles. Eyewitnesses say: "We would have to have the birds in the air in any event within 15 minutes!" It is vital military history that is prey to oblivion, but is now accessible to everyone - even for the local population, which today finally learns what happened at that time in their neighborhood. The two authors deserve thanks for saving the history. 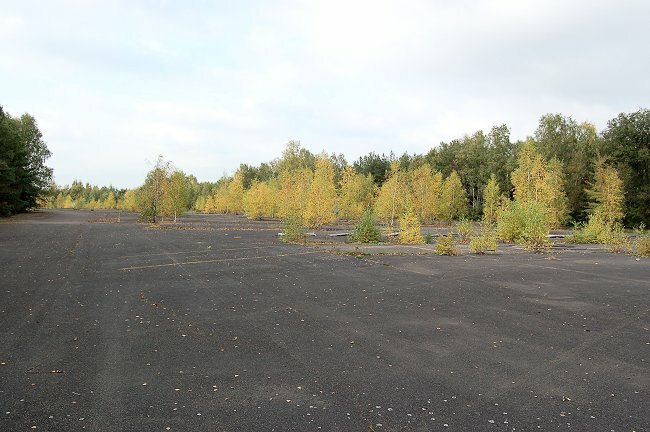 "Site II (Enkenbach) is still sitting in the forest south of the Kaiserslautern-Mannheim motorway. Apparently it was still used by U.S.Forces until the early 1990s or so as a comparatively new guard shack left of the entrance (DSC 2139) suggests, but was later abandoned and is now in a very derelict shape. There are two separted portions and it looks like the northern contained the actual launch pads (DSC 2142 and DSC 2143) and weather shelters whereas the southern portion housed some sort of barracks (DSC 2153) and maintenance buildings. 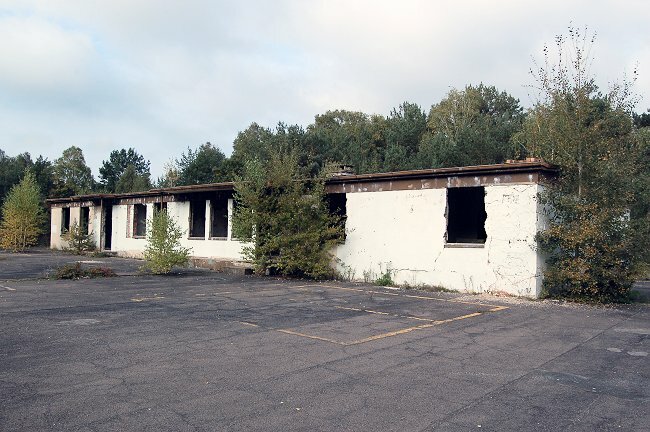 Maybe you can identify some of the remnants." This page is in no way sponsored or endorsed by the United States Air Force. Opinions and views expressed are those of the author and not necessarily those of the Department of the Air Force.